A Good Day To Die Hard faces one huge obstacle which it can’t overcome – the shadow of the original Die Hard (read the Movies In Focus review). It pales in comparison to that movie, and unfortunately it’s also the weakest of that its four sequels. A Good Day To Die Hard isn’t as bad as some would have you believe, but it’s just not up to the high standard of other films in the series. Bruce Willis’ John McClane is back, rushing to Russia in an attempt to help out his estranged CIA agent son, Jack (Jai Courtney). Things go horribly wrong for the McClane boys and they’re soon up to their receding hairlines in terrorists. Like the other movies in the Die Hard series, A Good Day To Die Hard finds John McClane in the wrong place at the wrong time. However, this time the all American hero is also a fish out of water, coming up against the world of espionage and Russian culture. Where A Good Day To Die Hard goes wrong is with the action – there’s just too damn much of it. What made the other Die Hard movies work was the set-up. They took their time to establish the plot and the characters, and then the action kicked in. However, John Moore’s movie is a non-stop demolition derby of CGI-enhanced destruction. The first three Die Hard movies felt plausible, with McClane taking beatings and showing the wear and tear, even if he was leaping from the top of a skyscraper, ejecting himself from an exploding plane or surfing a truck through a water filled tunnel. Live Free Or Die Hard upped the ante, and we saw McClane driving a car into a helicopter and leaping onto the wing of a jet fighter, but this fifth instalment sees the iconic character take on near super-heroic traits. I have no idea how many plate glass windows he runs through in this film – without even getting a scratch. 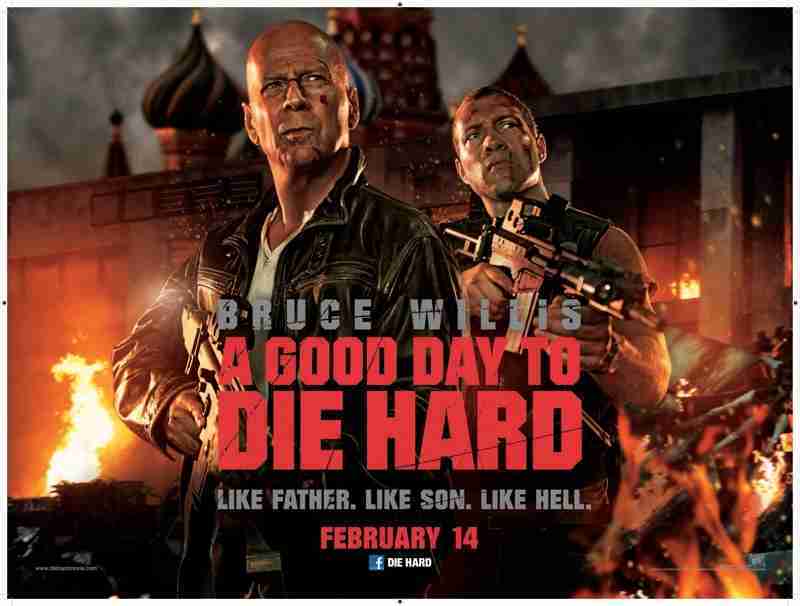 Like I said previously, A Good Day To Die Hard isn’t bad, it’s an enjoyable enough as brainless action flick. Bruce Willis is pretty engaged and Jai Courtney shows some solid action chops, but the film is let down by the urge to appeal to a young(er) audience. The franchise is a quarter of a century old, it shouldn’t have to tap into to the computer game crowd or the superhero audience. The success of Skyfall shows that audiences will turn up for an old fashioned action movie – if it treats its audience with respect and gives them room to catch their breath between set pieces. I wouldn’t be against a sixth Die Hard, but I just hope that the makers remember what made the first few films so enjoyable. Ditching the CGI, making room for more plot and interesting characters would be a good way to Die Hard. Trailer: ONCE UPON A TIME IN VENICE Looks Like The Best Bruce Willis Film In Years!